Welcome to the Roverlog Web Page! Find other hams in Cambridge, Massachusetts. 2017-08-07 - Version 2_7_5 is now available. This version corrects a bug with "distmult" scoring. You wish you had that high of a score! 2017-08-02 - Version 2_7_4 is now available. This version supports "distmult" scoring for the August UHF contest. 2016-09-20 - Uploaded a Cabrillo Log to KML converter. 2014-09-26 - Version 2_7_3 is now available. Completed support for 10 GHz and up distance-scored contests. 2014-06-23 - Original site back online. I've decided to put this site back up as the Google Code site is pretty hard to navigate. The latest version of RoverLog is 2_7_2 and is available on the download page. 2011-08-06 - Version 2_6_10 is now available. Changed Ini defaults to avoid trying to reach other RoverLogs and Modules via the network to stop sluggishness when they are not there. Rotor Module talks to ProSisTel rotor controllers with integers now instead of floats. 2011-01-25 - Version 2_6_9 is now available. Upgraded to new version of FreeWrap. 2011-01-24 - Version 2_6_8-1 is now available. Added range in kilometers to display. Added support for 2 rigs via Winkey. Fixed extra key/dekey before every keyer transmission. Converted peer communications to UDP to reduce network traffic and increase reliability. 2009-09-22 - Version 2_6_6 is now available. Added an option to make RoverLog stay on top of other windows. Corrected sending microwave frequencies to Elecraft K2 and K3 rigs. Corrected distance-based scoring to properly count only unique calls per band. Renamed the old Log Header Editor and skipped creation of a link to it during installation to prevent making old Version 2.0 Cabrillo headers. 2009-09-22 - Notes about Cabrillo Formats. Folks, please be aware that you have two choices to create the Cabrillo header for your log. Run logheaded3.tcl to interactively create a blank log with just the Version 3.0 header. Just run RoverLog without creating a header beforehand. RoverLog creates a blank 3.0 header that you can then fill in by clicking the "Log Header..." button on the main RoverLog window. Please note that there is a logheaded.tcl (without the "3") that creates version 2.0 headers. DON'T run this if you are entering a current ARRL contest. I will probably rename this one to something like logheaded2_DO_NOT_USE_THIS_ONE.tcl for the next release. If you have any questions or comments, please direct them to the User Group. 2009-06-04 - Version 2_6_5 is now available. This may be a record---two releases in one day. Go to the download page to get it. Fixed an issue where the Rig Module did not properly obtain the mode from the radio for some rig types. 2009-06-04 - Version 2_6_4 is now available. Added checkboxes for looping for each keyer message so some can be on and some can be off. Fixed an issue with redrawing maps where just your current grid would light up and all bands were considered, not just the current one. 2009-05-30 - Zip Code database for the Super Module now available. To use it, run the Super Module, then load the zip.mk database. To look up a Zip Code, type it in. To look up a city name, type it in either City, State, or ST-CITY, e.g. NY-MENDON. The second method is preferred because lookups are performed as you type and you can get a list of all cities that start the same this way. 2009-05-29 - Version 2_6_3 is now available. Added rotor position monitoring to the Rotor Module and the main RoverLog program so you can see your rotor tracking in real time. This takes the form of new fields for position vs. setpoint. 2009-05-14 - Version 2_6_2 is now available. Fixed issues with determining what rules we are running (application error with unknown $rules variable). Thanks to Ken VA3KA. Added serout.bat utility for use with a serial band switching aid. 2009-04-02 - Version 2_6_1 is now available. Fixed problem with distance and bearing calculations identified and troubleshot by John Isham (N1QLM). Thanks, John. 2009-02-19 - Version 2_6_0 is now available. Pretty major feature add: 6-digit grid distance-based scoring. This means that 10 GHz contests are supported now! Added 10g.ini contest file to support 10 GHz contests. 2009-02-05 - Version 2_5_3 is now available. Slight improvements to Rig Module, mostly invisible to the user. Added option to make RoverLog send voice keying commands to Rig Module instead of Keyer module. This works with the Elecraft K3 to trigger the radio to play a DVR message within the radio vs. using the PC. In addition to sending the last frequency used by band to the rig when QSYing, RoverLog now sends the mode as well. 2008-07-31 - Version 2_5_2 is now available. Fixed "skedrecd" bug when a sked with a 4-digit grid and no notes comes due. Skeds that are moved to the WIP list now stay in the sked list with a different custom color (default green). Skeds that have been made can now be manually deleted from the sked list. Made super lookup convert calls to upper case before doing the lookup. Fixed "windows(net)" bug when sending log. Fixed feature that gave preference to the default Lat/Lon in Super Lookup, thereby forcing your grid to FN13MM. Fixed serial port naming for ports over COM9: in GPS Module, Keyer Module, and Rig Module. The Rotor Module was already done. Added buttons for selecting among all available serial ports in the Modules using serial ports. 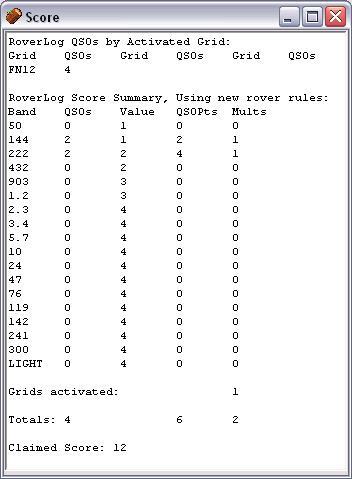 RoverLog now allows CALL/R and CALL (w/o /R) in the same grid to count as separate QSOs for scoring purposes. Fixed: Deleting a dupe lowered the indicated score until the log is reloaded. Double clicking on a log entry now edits it. Changed the prompt for logging a Rover to make it more clear, specifically, it no longer says the call is in the log in a different grid because it may no longer be in the log. 2008-06-09 - Version 2_5_1 is now available. Restored lookup of lofreq within Set_Freq to prevent an error calculating the current operating frequency. RoverLog no longer silently skips logging some dupes. Made Super Lookup send all results back to RoverLog upon lookup instead of just the first result. Fixed the PIJ database to remove the extra space in the notes field. Fixed issue that would prevent deleting records from Super Lookup databases. 2008-06-01 - Version 2_5_0 is now available. Clock did not restore its location. Fixed. Mark peers red if they are out of touch on the network. This does not affect normal operation, and it is cleared automatically when the peer comes back. This will indicate if there are network issues. Reduce number of messages logged to Net Log to make verbose logging more useful. When sending a sked, popup a message if the peer is incommunicado. Fixed 'can't read "stuff(blacklist,lookup)": no such element in array' error. Made Update rate 1 second instead of 10 seconds. Colorized Pass button on Station Info window to indicate the seat is ready to receive a pass (green) or should be consulted or skedded (yellow). If Log Sorting is disabled, put busy controls on the main window to allow the operator to set/clear his busy status for passing from there. Improved rig control and QSYing to retain the last operating frequency by band and send it to the rig (if any) when QSYing to the band. Speed up Super lookup with large databases by using indexing vs. the default linear search. Fixed: Can't change a working frequency for some reason. It refreshes to the default value. Fixed: Passing to 10368.1, Band shows up as 300G instead of 10G. When you change bands on pass window, if RL doesn't know the op freq for that band, use the best we know. Made the act of passing recommend the next available time for a sked if the target operator is busy. Pass window correctly picks the next free time for the target seat. If a sked is marked made, hide it in the display so it is not distracting. If a sked is marked made, overwrite with a new sked without confirmation dialog. Revised the "make pass" function to handle either passes or skeds. Upon completing a QSO, clear busy timer. Fixed issue with Super lookup Zip/FCC database where the program seemed to go into a tight loop on some machines. When I bring up the pass window, then change peers, RoverLog now updates the first available time. Download here: RoverLog Training Video (699kB). 2007-09-20 - Version 2_4_7 is now available. Fixed bug that would corrupt saved skeds file thereby losing all skeds. Popup dialog box to confirm adding skeds in the past. Return to sked window when invalid entry is detected when making a sked. Add normal windows-type menu to Ini File Editor so you can save from there. Because it has always asked you if you want to save when you exit, it will continue to do that too. Added a status field on the station information window that tells you who the other multi-op stations are working or what window the operator has open. This could be expanded in the future to indicate what the operator is doing as far as RoverLog can tell. 2007-08-21 - Version 2_4_6 is now available. Fixed bug that would raise a "sked isn't an array" error when logging a QSO. Fixed bug that would raise a "::setting(lookupgrid)" error when starting up without a roverlog.ini file. 2007-07-18 - Version 2_4_5 is now available. Fixed bug that would cause the rotor module to fail to start. Auto-reap (mark made) WIP and Skeds as they are worked, even if we don't explicitly accept WIP. Sort skeds by time when saving. Make Page Up and Page Down increase and decrease the keyer speed from the Keyer mini-window within the main RoverLog program. Return to saving 6-digit grids in the log. 2007-06-13 - Version 2_4_4 is now available. Fixed error calculating reverse bearing when a non-zero antenna offset has been entered. Added Cabrillo 3.0 Log Header Editor. The ARRL robot now accepts this version. Changed 1.2 to 1.2G, 2.3 to 2.3G, etc. up to 300 to 300G. Logs are corrected as they are loaded. Added bump functionality for rotors not intrinsically supporting it. This is done within the Rotor Module by a query, an increment or decrement of one degree, then a position command. THIS IS NOT TESTED, COMMENTS WELCOME. When saving log, truncate all grids to 4-digits. COMMENTS WELCOME. Note: the contest robot will reject QSOs with 6-digit "Sent" grids. Fixed error when cancelling "Save As" and then performing "Save". Start RoverLog with your log. 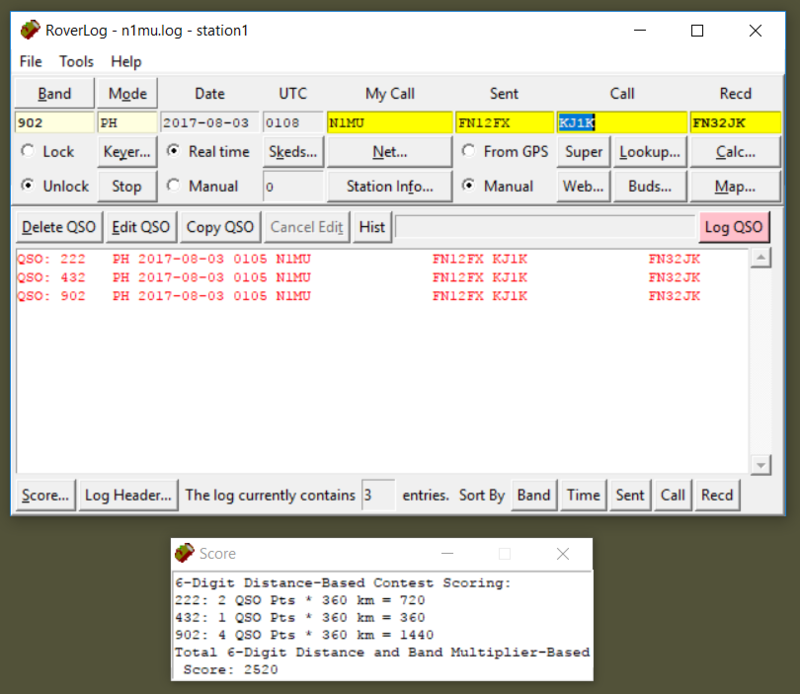 When your log is loaded, RoverLog translates 1.2 to 1.2G, etc. When your log is saved, RoverLog truncates 6-digit grids to 4-digits. 2007-01-19 - Version 2_4_3 is now available. Fixed a parsing error that made receiving a pass fail. Added the capability to change the height and width of the grid map. 2007-01-18 - Version 2_4_2 is now available. To speed up log loading, fill up the call stack only after the whole log has been loaded. Made annunciator and pass indication more pronounced. For sked window, added earlier/later buttons where scrollbar would be. Remove automatic azimuth in notes when making a pass or sked, it causes confusion if the operator changes the grid square without adjusting the Az. Moved send log and send skeds buttons away from net message on net window. Prompt to confirm sending whole log/skeds from Net window. Fixed: enter N2LB, space, EN99, space, T (to finish call), space. Grid lookup happens, but I typed EN99. Added an "Info" window to review old annunciator messages. Click on Info... to reveal. Made it so Super lookup does not cause Roverlog to lock up when RoverLog is set up to use Super lookup responses. W1RT alerted me to a "feature" that you might run across when loading logs. Version 2_4_1 expects 79-character log lines. This includes room for a 6-digit received grid square. When saving the log, RoverLog pads the lines with spaces if you have log entries with 4-digit squares (obviously you will). If you send the log through e-mail or otherwise process it, the two trailing spaces may get chopped off. Version 2_4_1 will get confused in this case and use the previous 6-digit square for successive entries. This will lower the score RoverLog indicates, but will NOT impact the score the ARRL calculates for you. If you have not post-processed your log or were careful not to chop off the 2 trailing spaces on these lines, this will not impact you. This will be fixed in 2_4_2, but if you absolutely must have a fix because your logs got cooked somehow, please use the patched roverlog.tcl, version 2_4_1j, located at http://roverlog.2ub.org/roverlog-2_4_1j.tcl. When version 2_4_2 comes out, I will no longer support 2_4_1j. I have updated the manual to version 2_4_1. You can download the manual from this web site, or you can visit the RoverLog Store to purchase a printed copy. 2006-06-08 - Version 2_4_1 is now available. Added new Pass Band checkboxes so you can tell the seat you're passing to (and all other multi-op seats) what bands a guy has. Added an option to disable Super Lookup's response to RoverLog prompting to use a found callsign/grid. Added a confirm dialog when deleting a record in Super Lookup. Super lookup now ignores "/R" etc. 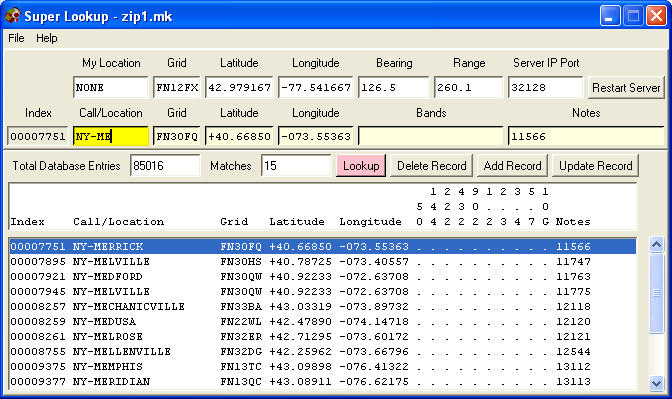 Super lookup now displays out grid first, then Lat/Lon. Added an option to allow Super Lookup to search as you're typing. Made it so the log now scrolls to the bottom after logging a local QSO. Rotor Module now supports DDE interface with user-specified service/topic. Added a concept of a sked that has been made. It's not deleted, just marked as complete. "Made" skeds are displayed in gray. 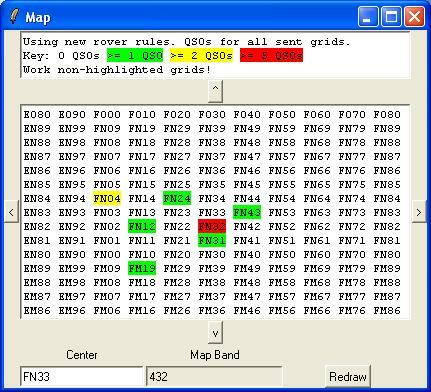 RoverLog is a contest logging program for VHF, UHF, and microwave contests that use Maidenhead grid squares as their exchange. The original specification for this program was written by Sigurd Kimpel, KJ1K. The actual program was written by Tom Mayo, N1MU. The program is distributed under the Gnu Public License, which basically means the source code must always be kept free. RoverLog was written in a language called Tcl/Tk (pronounced Tickle Tee Kay). Tcl/Tk is a windowed scripting language. Many Windows users will never need to know this as stand-alone executables are provided with the distribution. Other users must have Tcl/Tk installed. If you are running a non-Windows platform and do not already have Tcl/Tk installed, select this link http://www.activestate.com/Products/ActiveTcl/download.plex to find binaries for several platforms. If there are no pre-built binaries available for your platform, you can get the source code and compile it yourself from this link http://tcl.activestate.com/software/tcltk/downloadnow84.tml. Note: It's a good idea to make sure you are getting the latest version of Tcl/Tk if you decide to download it from this link. For Linux, here are some helpful links: http://www.redhat.com/apps/download/, http://www.debian.org/distrib/packages (Search for Tcl and Tk separately). For the brave, you can find out more about the development of Tcl/Tk here: http://tcl.sourceforge.net/. To use RoverLog's voice and CW keyer, the Snack library is needed. Windows users will find this library included in the distribution. Other users can find information about Snack here http://www.speech.kth.se/snack/. Logging is performed using an entry dialog in the Main Window and logs are stored as plain text Cabrillo formatted files. The log can be sorted by several fields to allow you to examine different patterns. If you wish to perform automatic position detection using an NMEA GPS receiver, run gps.tcl first. 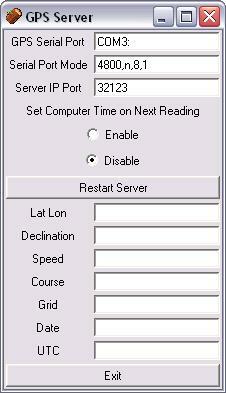 This provides a server which may be polled for the current grid square. To display the Calculator Window which computes the bearing and distance to the remote station, use the "Calc" button. To lookup a station in the log, click the "Lookup" button. The QSOs needed with this station from the current grid are listed. RoverLog performs lookups as partial lookups. Click "Score" to display the Score Window which keeps a running tally of QSOs, QSO points, and multipliers per band, as well as total score. The Cabrillo Log Header is loaded into a separate Log Header Window for editing. Each time the log is opened or saved, the header goes along for the ride. The score field in the header is updated with the running log. The Grid Map Window shows stations worked on the current band, and is accessed by clicking the "Map" button. The center grid and band for the map track the fields on the main windows. 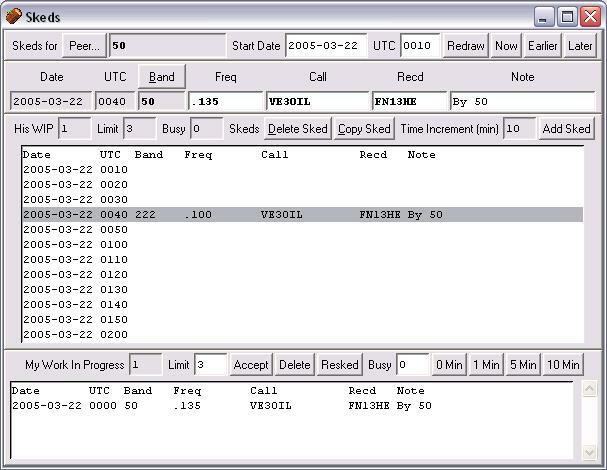 You can schedule QSOs using the Pass Window or the Sked Window. A popup reminds you of the sked when it is time. You can proceed with the sked or postpone. Skeds are saved to a file so they are reloaded if you restart RoverLog. 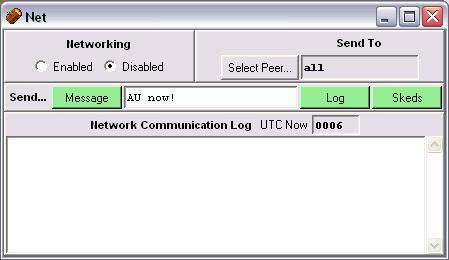 RoverLog's networking capabilities allow you to share QSO logging, type messages to other operators, and send logs. 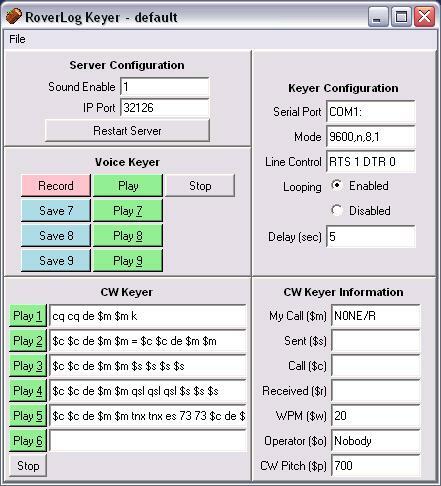 The Keyer Window allows you to automatically send CW and voice messages. 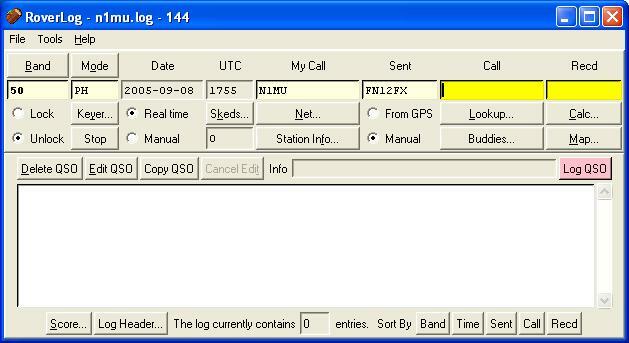 Five of the CW messages are automatically generated from the QSO information in the main screen and one CW message can be typed and sent on the fly by pressing Return. The voice messages can be saved to disk and are reloaded each time you start RoverLog. The keyer works with your computer's audio interface and uses the RTS line of a serial port for transmit keying. With RoverLog, you can enter QSOs in Real Time or after the fact with a single mouse click, without an elaborate procedure off line. 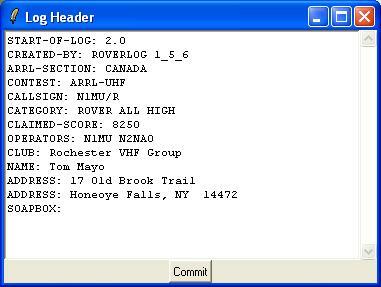 RoverLog has powerful QSO editing cababilities not found in other programs. Click "Edit" to bring the selected QSO into the editing fields. When done editing, click "Log" to write the modified entry to the log. While editing the entry, click "Delete" to remove it from the log. To abort editing, click "Edit" a second time. Options can be entered in a file called roverlog.ini. Here is an example roverlog.ini. Other examples are included in the distribution. Please consider joining the RoverLog Users Group so you can keep up to date on new releases as they become available. Click this link to download the complete RoverLog distribution. Please see the Quick Start section in the manual. If you like this program and/or would like more features, please send me e-mail at tmayo6 at gmail dot com. You are welcome to use this program as much as you want at no cost. If you would like to send a contribution of $10 to $20 however, please feel free, as long as you promise to let me know what features you want added or changed. You may also purchase items from the RoverLog Store.